Mark Robson (9827 0738) has organised three rides for your cycling pleasure. Saturday 26 August 2006 1:30 pm: Abbotsbury for Coffee: a nice easy ride. Saturday 23 September 2006 1:30 pm: Olympic Park Fountain: another nice easy ride. Finally, don't forget the 5 November MS Gong Ride! A letter from "The Great Energy Depression of the 21st Century"
Have you noticed how hard it is to follow some bicycle routes? Have you had trouble getting lost on routes that are marked on the maps? Ian Macindoe has published Saddle Survey of Parramatta to Liverpool Rail Trail (PDF), (MS .DOC) as well as the Saddle survey of Route 2 of Parramatta Cycleways Plan. MS .DOC format. Rob Kemp has set up a web site about the M7 with his own suggestions for improvement. He has even provided a spreadsheet listing places to eat and drink! Well done, Rob. The local bicycle committee has sought some advice from the RTA legal dept. regarding the legality of using various wheeled transport devices. The result has been interesting. It appears that AT LAW a person travelling on a wheeled device is either a vehicle or a pedestrian. There can be no other interpretation. The dividing factor is the POTENTIAL speed of the device. 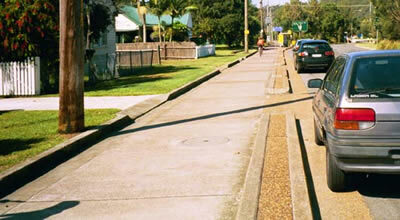 If the device is INCAPABLE of travelling more than 10 km/h then a person using that device is deemed to be a pedestrian. In ALL OTHER CASES, the device is a vehicle. Therefore the rule that many councils have made that any group of cyclists that includes a child under 12 years old may ride on any footpath is an important one, otherwise they are required by state law to act as vehicles once they can exceed 10 km/h. Now of course we all remember that a vehicle is either a motor vehicle or a bicycle. A bicycle is a PEDAL-POWERED device, and if power assisted has a maximum power of 200 watts. If fitted with a brake and a horn or bell it is a legal vehicle during the day; and with front and rear lights is legal in the night as well. Assuming these extras are fitted a bicycle enjoys all of the rights and privileges of any other vehicle ( if you are game to ride on the Cumberland Highway you are legally allowed ), but of course is also bound by all road rules. However, if the device has a power output of more than 200 watts then it is deemed by law to be a motor vehicle; and must be registered for use on the road. In order to be registered it must comply with all the proper Australian Design Regulations, such as exhaust pollutant content, blinkers, crash testing and so and so on and so on. This means that the baby motorcycles going around, usually ridden by teenagers whose parents have more money than sense, cannot be legally ridden on the road without registration. They also cannot be legally ridden on shared paths, as they are neither a bicycle or a pedestrian. These small motor bikes are deemed to be 'unregisterable vehicles' as they do not comply with the ADR's. Their legal use is limited to private property. I would like to see the law altered so that ANY bicycle travelling at less than, say 5 km/h, is deemed to be a pedestrian. This would allow cyclists to slowly and politely negotiate such things as railway underpasses and shopping malls without the risk of a fine. [5.3.05] The gates are finally open from Walpole St Park to the new Holroyd Gardens.By leaving the rail trail at Merrylands Rail underpass, following the Pitt St footpath, going through Walpole St Park and Holroyd Gardens there is now smooth safe path all the way to Fox St and onwards under the M4 toward Homebush Bay. This route bypasses the narrow footpath route under the railway bridge beside Woodville Road near Granville. The off-road path has been extended through Auburn beside Adderley Street, so a good safe route now exists all the way to Olympic Park. Travel to the Easter Show by bike, it's now quite easy. Council maintenence on the Lower Prospect Canal area has been improved to include removing grass clippings after mowing and doing the edges. That's 12 kilometres of edges. Bottles in the long grass can be invisible from the mowing tractor so watch out for shattered glass if the grass is freshly cut. [5.3.05, by Mark Robson] The Duck River rises in the gutters and drains of Bankstown and flows north, entering the Parramatta River at Silverwater. It has long been recognised as an important feeder to the ecological health of the upper Parramatta River. At first glance on a cycleway map it's hard to follow, but if you are prepared to ride on quiet back roads across a couple of short missing links the entire valley can be followed. Being a river valley the steepest gradient is the rail bridge at Clyde. It's an easy beginners ride with a quiet introduction to on-road traffic situations. We start at Silverwater Park and head through the industrial area, empty of life on a weekend, soon there should be cycleway from Parramatta River to M4. 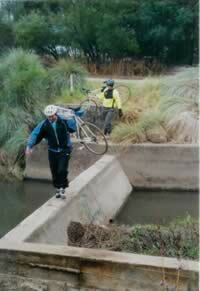 After passing over the M4, we return to and cross Duck River on the cycleway bridge, and head to Martha St. The first major missing link is from here to Clyde rail station, but after crossing Parramatta Rd at the James Ruse Drive lights the railway station provides a quiet track crossing. Heading down Factory Street brings us to Mona St and the best part of the cycleway. It follows the river for some lovely riding. Watch out for the ducks crossing the path and make sure you take a peek at the Japanese gardens just south of the baseball fields. After skirting the golf course the cycleway section comes to an end, just north of Norford Park. The best route south from here is across the river, and near the termination of Boundary Rd there is a small causeway that allows us to cross. (See photo ) Be very careful at the narrow bridge crossing the Pipeline in Hector St, resist the temptation of ale in Helen St, and find the railway underpass in Woods Rd. From here the canal is best followed beside Jim Ring Reserve, but stop for a drink and perhaps a picnic at Maluga Passive Reserve. There is an uninterrupted green space all the way to here from the causeway; one day this will carry cycleway, if we continue to dream and to work towards it. The last major obstacle is the Hume Highway; and the small linear reserve at the end of Gascoigne Rd gives access to a set of traffic lights. A few metres down the next side street brings us to the Bankstown to Parramatta regional bike route which is a well signposted route to Bankstown or the Velodrome. The Parramatta to Bankstown regional route was originally all on road, and for confident road riders still is a good option. However now that Auburn section of the Duck River cycleway and the M4/Fox St project are complete a trip between these two regional centres can now be enjoyed via this more scenic and relaxed route. There's only 7 kilometres of cycleway to go to link Clyde to the 'end of the track' at Bankstown Velodrome. Write to your local member asking to get it finished. A completed loop from Clyde to Fairfield will be a real boost to cycling in this area. Adderley St now has an off-road path all the way from Duck River to Sydney Olympic Park, but the awful Silverwater Rd crossing remains. This means it is now possible to get from Cecil Hills to Meadowbank WITHOUT PUTTING A FOOT DOWN except for comfort breaks, i.e. no traffic interruption whatsoever! Not one. The route is: Western Sydney Regional Park, Prospect Reservoir, Prospect Creek, Rail Trail, M4, Stubbs St, Silverwater industrial area, riverside path, Olympic park, Bicentennial Park then across old rail bridge. Truly amazing. It is now possible to do a century, 100 km, ride in Western Sydney on cycleways nearly all the way, and only three halts at traffic lights, Silverwater Rd, Hume Hwy and Horsely Drive. A truly awesome network is now available for us to enjoy! Blacktown council are looking at installing some bicycle racks outside their new library which is currently being constructed. CAMWEST has been asked to comment/recommend some. Here in the future, the design of cycleways has become an art form, with engineers putting their creative skills into action (and even laughing at the bad old days when a stencilled bicycle on a road, most often invisible under a parked car, was standard practice). Above is a wonderful example of a shared path beside a road. Instead of having the path right up against the fences, there's a gap so that any cars reversing out of driveways have the opportunity to see cyclists, and the cyclists can see the cars. See Also Cycle Lane Design. "While people talk about new technologies and they say as soon as oil reaches a certain price everybody will switch over to hydrogen and what have you. The reality is that it may not be as simple as that and you have to wonder whether over the next decade we won't start to get towards peak production and that could be a very interesting time and a very challenging time." The Roads and Traffic Authority has slashed its cycle funding by as much as two-thirds to $5.6 million - equal to just 0.17 per cent of its budget to build roads. We need more members to achieve better bike facilities in Western Sydney. There's a number of projects we'd like to get involved in. Join us and make a difference. Why not read our advocacy pages and do something to improve cycling in Western Sydney?See our letter writing page.